Portable induction cooktops have been growing in popularity over the past few years, and for good reasons too. Portable units are convenient. 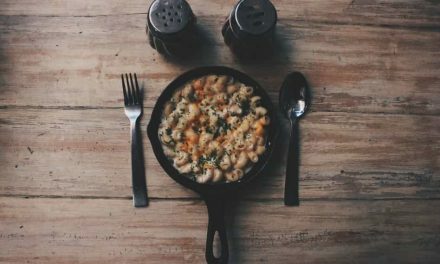 For those living in small apartments or who just need an extra burner to cook on, they can have the convenience of owning an extra burner without it costing a ton of money or taking up too much valuable storage space. They are affordable, compact, safe, and efficient. It is very important that you use only induction compatible cookware on these units. Never rely on checking materials only, look for an induction compatible symbol or description. 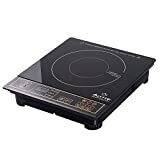 Induction cooking is often more efficient than other cooktops as it only heats the area that is in contact with the cooking vessel, rather than the entire cooking element. This is done because the induction cooktop uses a coil that an electrical current runs through, which creates a magnetic field. Once you have set an induction compatible cooking material such as cast iron onto the element, the magnetic field creates heat. Some of the benefits of this are faster heat up and cool down times. It also cooks time-consuming food such as rice and beans at a faster rate. The faster cool down times are one of the most appealing aspects of induction cooktops, especially in homes with children. Even if the cooktop is turned on, a lot of units will be cool to the touch within seconds after removing the pan from the burner. In this article, we will do the best portable induction cooktop review. We’ll discuss the options on the market so that you can make an informed decision before making your purchase. 3 You have Successfully Subscribed! The Duxtop 8100MC portable induction cooktop was an easy first choice. It is an all-around fantastic unit. For starters, this unit is extremely efficient and uses 90% of the energy that it draws to get the job done. The burners are self-adjusting so that it can detect the size of the pot or pan being used and ensure that the energy is being directed at only that area. This unit comes with a ton of safety features that you might not find on other models. There are technologies in this unit that can detect if you are using an incompatible piece of cookware. If it detects improper cookware or no cookware at all, it will shut off automatically within 60 seconds. However, it will also alert you so that you can act faster and prevent a potential accident. There are added features such as digital timers ranging from 1 minute to 3 hours, temperature ranges from 140 degrees to 450 degrees, and power levels from 200-1800 watts. This makes this unit a fantastic option for a number of cooking tasks. It doesn’t really matter if you need to cook beans for three hours or boil water for pasta within minutes. You can rest easy knowing that it will get the job done quickly, efficiently, and safely. Additionally, this unit is quite small and aesthetically pleasing. The entire unit is black, making it a versatile addition no matter what style of kitchen you have. The cooktop itself is made out of a shiny and smooth ceramic glass that looks modern in design but is also easy to clean if you spill during the cooking process. Ceramic is a fantastic option for these units because it is durable and can be cleaned using numerous products. The Digital control panel is easy to read and even easier to use as all of the buttons are colored in gold and outlined in a gold frame. The unit weighs under 6 pounds making it incredibly lightweight compared to its competitors. It has raised feet making it easy to pick up and place where necessary. It is also compact, easy to handle and store, and yet provides enough cooking area for any cooking task. Additionally, you can use it wherever you want as long as there is a standard outlet socket available. On top of all of that, this portable induction cooker is the most affordable for its features. It has the best price to quality ratio with countless positive customer reviews to back it up. The Copper Chef Round Pan 3-Pack is a three-piece bundle. It seems like a great deal, but do these pans really hold up? The pans come in three different sizes, small (8 inches), medium (10 inches), and large (12 inches). 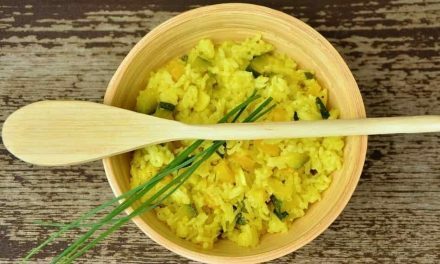 They all have relatively high sides, which means they can also be used for things other than frying, like sautéing or stir-frying, quite easily. They have a stainless steel induction plate on the bottom to ensure that the pan warms up quickly and distributes heat evenly. They feature a custom non-stick coating called “Ceramic-Tech”, which is PTFE & PFOA free. This coating is non-toxic and very effective. They are hard-anodized, improving their durability and overall lifespan. The handle is heavy-weight aluminum, making it equally durable and safe for the oven. While the material is durable for the price, it still remains fairly lightweight, making it easy to handle and store. 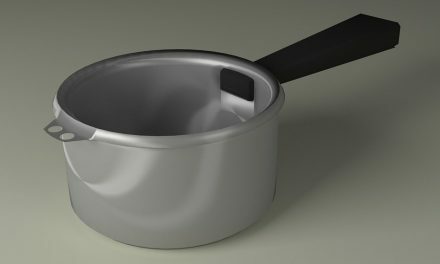 All of the pans are scratch resistant, even when using metal utensils, so long as you don’t press them too hard into the pans. This is the most affordable portable induction cooktop on the market. The Secura 9100MC is an easy choice for our runner-up due to its variety of features. Much like its successor, there are varying power levels from 200-1800 watts to ensure that you get to use the amount of energy that you feel comfortable with. You can cook a variety of different dishes that require different heats ranging from 140 degrees Fahrenheit to 460 degrees Fahrenheit. Adjusting the temperature from high heat to low heat is as simple as pressing a button. Speaking of buttons, this portable induction cooktop couldn’t be easier to understand or operate. The angled digital control panel is positioned perfectly so that you have no trouble reading or accessing the buttons. The angle of this control panel is quite a nice feature. 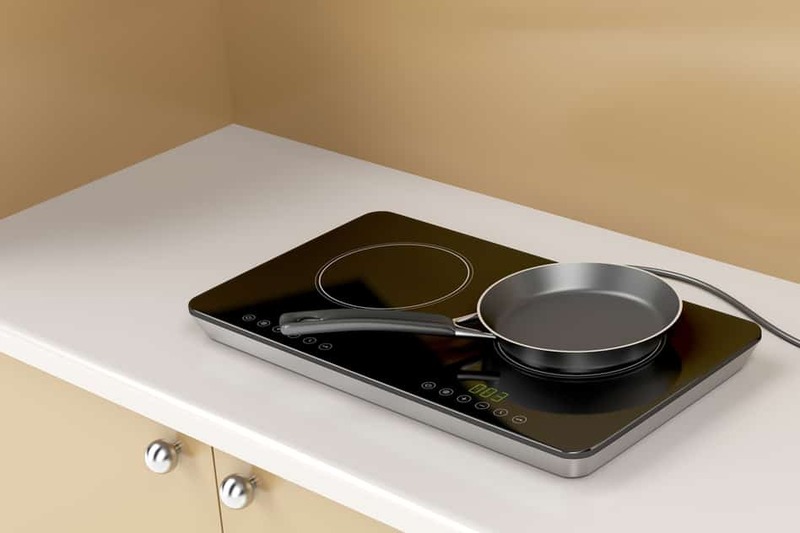 Many of the competitors are level with the cooktop, while this angle adds an extra level of safety. You can lower the heat or higher it with a simple press of the button knowing you aren’t going to accidentally burn yourself if you get too close to the cooktop or piece of cookware you are using. These buttons are big, clear, and highlighted with a white frame so that you don’t accidentally select a function thinking it was something else. The unit is versatile with a sleek, black, and modern appearance. The ceramic top is smooth, glossy, and level. While the aesthetics of a cooktop are not the most important thing in the world, it is nice knowing you can set this anywhere in the house and it won’t be an eyesore. The whole unit weighs under 7 pounds making it light but a bit heavier than its successor. Its dimensions are also quite a bit bigger but the cooktop is still very compact and easy to store when not in use. It also doesn’t take up an unnecessary amount of space on your counter or tabletop when you are using it. Some of the additional features on this portable induction cooktop is the auto-pan detection. This is quite nice as the unit will only start to heat up your cooking vessel where and when it is detected on the surface. It will also turn off within a minute if it senses there is no longer a piece of cookware on it. There are numerous diagnostic errors warnings programmed into the system to let you know when something is wrong so that you can act quickly and appropriately. The angled digital control panel makes using the unit much safer, especially for those who might be on the clumsy side. For some of us, one cooktop is just not enough. That is where this NutriChef Portable Dual Induction Cooktop comes in. Sometimes you just need a little more space. Whether you are running out of space on your built-in stove during Thanksgiving dinner, or you decided to take your loved one to a cabin on Valentines Day and are whipping up a home cooked meal, this cooktop checks all the boxes. This unit uses two circular heating zones that are specifically marked so that you know exactly where to place your cookware. There are temperature zones that you can adjust to your needs. There are multiple pre-programmed cooking modes that can be switched as needed during the cooking process. However, if presets are not what you are into you can still use the manual function to steam, fry, or boil. One of the unique features of this unit is the warming function to keep food warm but not overcook it until you or your guests are ready to eat. There is also the addition of a countdown timer so that you never overcook your food if you need to walk away for a moment. This is a life-saving feature for many of us! The safety of this unit surpasses the rest. If you have kids, look no further as there is a specific built-in child safety lock which makes all of the buttons inoperable while in use once it has been activated. While induction cooktops are about as safe as a cooktop can get, this setting just makes it a touch safer. It prevents unnecessary injuries such as scalding and burns. Additionally, like other cooktops, it does include an automatic shut off feature if it overheats, or detects cookware that is the wrong size or made with incompatible materials. You can expect the same fast heat up and cool down times as you would with any other induction cooktop. It also cooks food much quicker than gas or standard electric units. The unit is quite large but keep in mind you are getting double the cooking space. That said, for the amount of cooktop you are getting, it is still quite compact. It is not the heaviest cooktop in the world but coming in at almost 13 pounds it is probably not one you will be traveling with or moving around very frequently. Fortunately, it is still quite thin and compact so it can be stored quite easily. The ceramic cooktop is made with a glossy black tempered glass that is both stain resistant and non-stick. The sensor touch is responsive and easy to read with its white frames and symbols. With this cooktop, you should have no problems getting the job done quickly no matter how big or small of a meal you are cooking up! Two burners running on 120V for maximum energy efficiency. The Rosewill RHAI-16002 Portable Induction Cooktop is a unique option. This is the perfect choice for someone in college who doesn’t have the time to cook and needs something that is as easy to use as a microwave. College students would have no trouble being able to use this unit since most colleges accept portable induction hot plates. It comes with 5 pre-programmed cooking settings, making it one of the most convenient options available. Instead of fumbling around and selecting different heats along with wattage, everything is already set up for whatever you could possibly need to use it for. Whether you need to warm up some milk for your coffee or sauté vegetables for a stir fry, everything you need is only a button away. Other settings include hot pot, fry, and soup. If you do, however, need to choose your own custom heat and wattage, it can still be done quite easily. The cooktop is black with a polished crystal plated surface. The buttons are gold and pop off the shiny black surface quite nicely, making it very easy to read and use. It also features a decently sized and positioned LED display so you always know what temperature you are cooking at, what setting you are on, or any error readings that might surface. This cooktop comes in at just 5 pounds, making it the lightest option we have reviewed. This makes it easy to pack around the kitchen as well as travel with it if you wish to do so. Its slim and compact design makes it easy to transport and to store in tight spaces. Another unique feature about the Rosewill cooktop is that it includes a 3.5-quart stainless steel pot and a magnetic strip. This pot is made of surprisingly good quality and high-grade steel. It is quite deep and works well when using non-stick sprays. If a magnetic strip sticks to the bottom of any of your current cookware, then it should be induction compatible. If you are unsure, you can call your manufacturer or do a quick search online just to be safe. The 8 power levels range from 300 watts to 1800 watts, while the temperature settings start at 150 degrees Fahrenheit and top out 450 degrees. All of these versatile settings make this unit perfect for braising, deep frying, roasting, and boiling. There is really no cooking task that you can’t do safely or efficiently with this cooktop. The price point of this particular cooktop is right in the middle. It is not the cheapest model we have reviewed, nor is it the most expensive. Pre-programmed cooking settings make for a quick and easy to use cooktop. The Cuisinart ICT-60 Double Induction Cooktop is the perfect portable unit for those who need a lightweight cooktop, but with as much cooking surface as possible. When it comes to quality small appliances, Cuisinart is a name you know and you trust to deliver a reliable product. This portable induction burner is no exception. It comes equipped with fast heat up and cool down times that you would expect from an induction cooker. However, a bonus is that it comes with two burners so that you can double the amount of food you need to cook. The dual heat options are endless with 8 settings on the left-hand side and 5 settings on the right-hand side. Each burner has an individual timer that can go up to 2.5 hours. Each burner has its own on and off button. This might seem like an unusual feature to get excited about, but it is quite helpful. If you are cooking on both burners but your food is done on one side and you don’t want it to overcook, you can simply turn it off and it will cool down right away. There is also an additional safety feature that will turn the unit off completely after 30 seconds if it senses a pot or pan has been removed and you forget to hit the off button. This is a very fast response time, especially because other portable induction cooktops have a 1-minute sensory time for this. This unit gives off a lot less heat than regular electric and gas cooktops. Therefore, you don’t have to worry about it heating up your kitchen in the summer months. It also uses up to 70% less energy than a standard cooktop would. This makes it a fantastic option for those who are trying to save money on energy bills or do their part to help the environment. If you are entertaining guests for the holidays, you can rest easy knowing you didn’t ramp up your utility bill just to cook a few extra dishes. The unit is almost entirely black with a steel strip along the bottom where the controls and display are. The buttons are simple circles with easy to read descriptors. The glass top is smooth and level, making it look sleek and modern. It also makes it quite easy to wipe clean without worrying about food getting stuck in uneven spaces. Additionally, this unit is reasonably lightweight, coming in at under 12 pounds for a two burner cooktop. It is thin and compact and should be able to fit into any storage space you have planned for it. This would be the perfect solution for someone in college or on the road in a recreational vehicle. It is safe to use and wouldn’t be a hazard like gas options would be. The most lightweight and compact dual portable induction burner on the market. Portable induction cooktops can be a fantastic option for various situations. 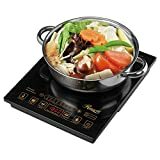 Whether you are running out of cooking space during the holidays, a student in college, or a traveller looking for a low energy cooktop, a portable induction burner is the way to go. They can also be a great option for those who are looking to reduce their environmental impact or just looking to save money on their electric or gas bill. These cooktops are safe to operate, easy to understand, and usually quite affordable. Even if you buy one on the more expensive side, the money you will save on your energy bills will pay for the cooktop in no time. The hardest aspect of a portable induction cooktop is trying to decide which one is for you. With so many options available, the decision can be daunting. However, a lot of them come with fantastic safety features and pre-programmed options so that you can choose the right option for your individual living situation. If you have kids, you might want to choose something with a few more safety features. If you are a bachelor, maybe choose an option that has presets. The options are endless. The most important aspect of one of these units is ensuring you have the proper cookware. Not using the appropriate materials could result in damage or injury, and while many of these units come with safety features to protect you from that, it is always better to be on the safer side. Who knows, maybe you already have an induction compatible cookware set. We hope this best portable induction cooktop review shed some light on the best options on the market. Our goal is that when you decide you are ready to make your purchase, you can feel confident knowing you made an informed decision.